The Boyup Brook fox shoot was held on second weekend in February. 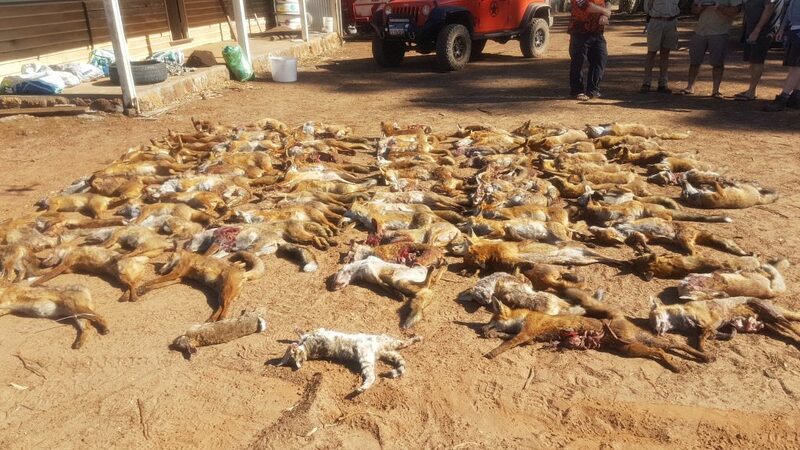 Organized By Marc and Erlanda Dees of Rylington Park, saw local hunters and hunters from other shires and Perth form 47 teams that collectively took out record 705 foxes, 170 rabbits, 18 cats and 2 pigs. The event was strongly supported and sponsored by many businesses and organizations. Prizes were presented to winners of various categories. FOXBUSTERS was one of the teams and shot 29 foxes and 1 cat. Ross and Graham on a spotlighting sortie in Rover the buggy (Graham driving). Armed with a rifle, .223Rem firing 55gn Ballistic Tip projectiles @ 3,150fps. A rifle .243Win firing 70gn Ballistic Tip projectiles @ 3,500fps and 12Ga shotgun firing BB size shot. Fox 1 A 6.72kg male 2 ½ Yo, came from 200m to the sound of the “Secret Weapon” (SW) and stopped at 35m. Ross took him with his .223. He had eaten beetles, caterpillars and had 7 tape worms and a round worm in his small intestine. Fox 2 This time a 1 ½ Yo female, 5.33 Kg came to 35m and succumbed to the .223. Gut contents, carrion, beetles and caterpillars. She had given birth to 4 cubs. Fox 3 Graham took at 231m a 2.79Kg male cub with his .243. It was on a dam bank in a canola stubble. It had eaten canola, beetles, carrion and earwigs. Fox 4 Was called in from 400m to 50m. Ross, with his .223,took this 1 ½ Yo, 5.75kg female that had not given birth, but had eaten canola, beetles and grasshoppers. Fox 5 An adult fox also came to the (SW) at the same time. It turned and ran away through high grass when Ross shot fox 4. At about 85m, it was stopped by a snap shot from Graham’s .243. It could not be found for examination. Fox 6 Would not come to any caller, so it was perused for about 700m when Ross flattened the 2 ½ Yo female weighing 4.38kg with the 12Ga shotgun. She had eaten Grasshoppers, Barley and Canola. One round worm was in the small intestine and she had birthed 6 cubs. Fox 7 At 80m from an awkward position and a nearly obscured position Ross managed to take this 2.46kg female cub with his .223. It had a varied diet of Carrion, Beetles, Earwig, Caterpillar, Canola, Earthworms and a Lizard. There were 7 other foxes that were seen but not shot at due to distance and lack of opportunity. FOXBUSTERS as a concept and website is 6 years old. the SSAA Australian Shooter magazine (Feb 2016) featured an article on FOXBUSTERS. since then there has been over 760 requests for the “Secret Weapon”. Some useful networking is happening – a meeting of like minds is taking place. There has been only one public speaking event last year with equipment demonstrations and a PowerPoint presentation. The article in the ‘Shooting Australia’ website entitled “Lady With A Gun” has been well read. This lady put to words a an accurate assessment of shooters and the feral animal problem in Australia, which is shared by us FOXBUSTERS. Over 600 foxes have been examined by necropsy, discovering an amazing variety in their diet. Vixens examined for pregnancy and/or cub numbers birthed. As well as stomach contents, the small intestines are examined for parasitic worms (tapeworms and roundworms). Click on the links to read more. On May 24 2017 FOXBUSTERS® became a registered Trademark. Many reports of successful use of the “Secret Weapon” are coming in, but we would like to hear of more of the fox being outfoxed! Foxes are attracted to the sound of an animal or bird in distress. Logically a distressed animal would be easier to catch and eat. Play this sound, it effectively attracts foxes where they have had experience with catching birds. Even at night when spotlighting for foxes, when a foxes eyes are seen, switch off the engine and all lights except one spotlight which is shone low keeping the fox eyes illuminated in the upper edge of the beam. Foxes are known to gallop towards the sound. More on use. Please fill the form below to request a mp3 copy attached to a reply email. Scope Quality – capable of withstanding the recoil of the caliber. On March 16, 2018 the fox hunters of Tunney took out 5 cats, 78 foxes and 24 rabbits for the 28th Tunney LCD Annual Fox shoot. FOXBUSTERS was one of the teams involved in the shoot. The Tunney group has taken 1,124 foxes, 64 cats and 1,025 rabbits in the past 28 years. Why do FOXBUSTERS® target foxes? The European red fox (Vulpes vulpes) was introduced into Australia in the 1870s for recreational hunting. Their subsequent spread was rapid and they are now responsible for environmental and agricultural impacts valued at over $200 million per annum. There would be over 3 million square kilometres of potential fox habitat in mainland Australia. In the agricultural areas of Western Australia where the 2012 FOXBUSTERS research was conducted, fox population densities averaged one fox per 0.7 square kilometres (1.4 foxes/km²). We are concerned that there could be 4.2 million foxes in Australia. Because foxes can jump, dig or burrow and climb, fox-proof fencing is extremely expensive to erect and maintain. Fencing is only an option in specific areas for high value livestock. FOXBUSTERS members are involved in these events, but continue the culling of feral (introduced) animals throughout the year. There are few natural predators that control fox numbers in Australia. Wedge Tailed Eagles, some snakes, large goannas, feral cats, dingos and wild dogs will sometimes prey on young foxes. Foxes were introduced for sporting purposes, but they now must be controlled. Are they fox eyes in my spotlight? The colour of fox eyes can vary depending on many things. A. The colour of the spotlight being used; HID, halogen or coloured filters will have an effect on the retinal reflection colour you see. B. The age of the fox may have an effect. C. How directly the fox looks at the light. D. The distance between your eyes and the light source (reflective angle) can affect the colour. What colour am I looking for? Usually greenish yellow. However white, orange and even red eyes can be a fox. Cats, sheep, cattle and dogs can share the same colour as foxes. The space between the eyes can sometimes determine whether or not it’s a fox. The movement of the eyes is the next thing to look for. You may see a fox or a cat blink. A fox’s eye may move quickly whereas most other animals don’t move so quickly. A fox may only give a quick glance compared to a sheep for example. A fox may be seen apart from a mob of sheep, but sometimes within the mob but moving differently to the sheep’s eyes. Because other creature’s eye reflections are similar to fox, you must identify the animal before shooting. Cats, sheep, cattle, wolf spider and fox eyes can look similar in colour. Deer have particularly bright eyes. They group together quickly and move quickly when startled. Animals with a more red appearance are kangaroo, possum and rabbit. Always positively identify the animal before shooting. Trapping foxes can be a very effective way to reduce fox numbers. Foxes approach their food mostly in an anticlockwise direction. I have designed a trap that allows for that habit. The trap is still being refined.